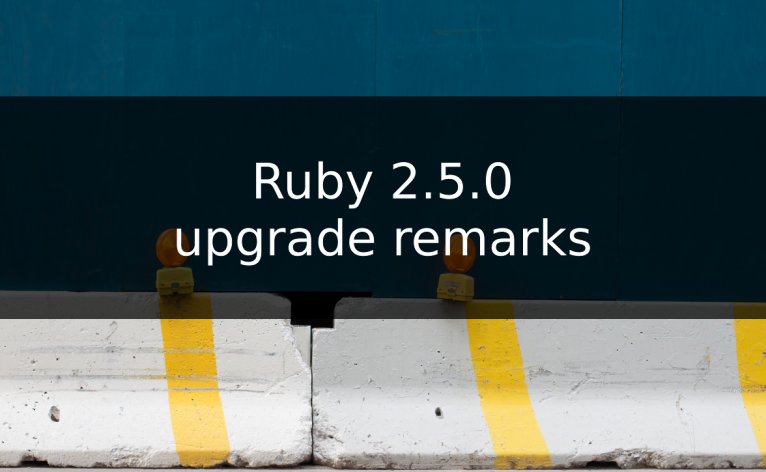 There’s a lot of articles already on the new shiny features of Ruby 2.5.0. But here are some problems and challenges you may encounter during the upgrade process. Note: Devise team already fixed this one with the new Devise release. Probably in few days, there will be a Devise gem release that will fix that for RubyGems as well. If you use ActionCable, then it is a good to postpone the upgrade until this issue is fixed and the upgraded version of ActionCable has been released. Note: Travis already fixed this one. exec "$bindir/ruby" -x "$0" "$@"
If you use Dir::Tmpname#make_tmpname, it is no longer available. Long story short: you need to generate unique names on your own. Click here to see how Rails core team did it. Cover photo by: Victoria Pickering on Attribution-NonCommercial-NoDerivs 2.0 Generic (CC BY-NC-ND 2.0) license. Changes made: added an overlay layer with an article title on top of the original picture. Note: If you’re using old Errbit version (0.2.0, 0.4.0) and an old Airbrake version (v4) please refer to this manual to make it work with self-signed certificates.